In this work, a rapid and easy capillary electrophoretic method for simultaneous determination of benzoic acid and sorbic acid in food samples using direct UV detection was reported. The separation of acids was achieved in fused silica capillary at 28 kV. 20 mM borate buffer at pH 9.3 was used as running buffer; cinnamic acid was chosen as internal standard for quantification. Under the optimal separation conditions benzoic acid and sorbic acid were detected in 3.1 min. The linear ranges were between 0.005-0.4 mM. The correlation coefficients for each calibration curve were calculated as 0.999. The reproducibility of peak area and migration time for each acid were less than 3% (R.S.D.). The limits of detection were found 0.405 mg/mL for benzoic acid and 0.415 mg/mL for sorbic acid. The limits of quantification were 1.35 μg/mL and 1.38 μg/mL respectively. Boyce, M.C. (1999). Simultaneous determination of antioxidants, preservatives and sweeteners permitted as additives in food by mixed micellar electrokinetic chromatography. Journal of Chromatography A, 847, 369-375. Brul, S., Coote, P. (1999). Preservative agents in foods - Mode of action and microbial resistance mechanisms. 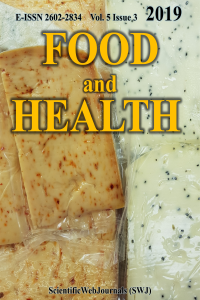 International Journal of Food Microbiology, 50, 1-17. Frazier, R.A., Inns, E.L., Dossi, N., Ames, J.M., Nursten, H.E. (2000). Development of a capillary electrophoresis method for the simultaneous analysis of artificial sweeteners, preservatives and colours in soft drinks. Journal of Chromatography A, 876, 213–220. Han, F., He, Y.Z., Li, L., Fu, G.N., Xie, H.Y., Gan, W.E. (2008). Determination of benzoic acid and sorbic acid in food products using electrokinetic flow analysis–ion pair solid phase extraction–capillary zone electrophoresis. Analytica Chimica Acta, 618, 79-85. Hsu, S.H., Hu, C.C., Chiu, T.C. (2014). Online dynamic pH junction–sweeping for the determination of benzoic and sorbic acids in food products by capillary electrophoresis. Analytical and Bioanalytical Chemistry, 406, 635-641. Kuo, K.L., Hsieh, Y.Z. (1997). Determination of preservatives in food products by cyclodextrin modified capillary electrophoresis with multiwavelength detection. Journal of Chromatography A, 768, 334-341. Li, B., Li, Y.K., Wang, X.Y., Wang, F., Wang, X., Wang, Y.F., Meng, X.J. (2015). Simultaneous separation and determination of organic acids in blueberry juices by capillary electrophoresis- electrospray ionization mass spectrometry. Journal of Food Science and Technology, 52, 5228-5235. Lin, Y.H., Chou, S.S., Sheu, F., Shyu, Y.T. (2000). Simultaneous determination of sweeteners and preservatives in preserved fruits by micellar electrokinetic capillary chromatography. Journal of Chromatographic Science, 38, 345-352. Marsili, N., Sobrero, M.S., Goicoechea, H.C. (2003). Spectrophotometric determination of sorbic and benzoic acids in fruit juices by a net analyte signal-based method with selection of the wavelength range to avoid non-modelled interferences. Analytical and Bioanalytical Chemistry, 376, 126-133. Mota, F.J.M., Ferreira, I.M.P.L.V., Cunha, S.C., Beatriz, M., Oliveira, P.P. (2003). Optimization of extraction procedures for analysis of benzoic and sorbic acids in foodstuffs. Food Chemistry, 82, 469-473. Naseri, A., Farahmand, F., Sheykhizadeh S., Tabibiazar M., (2017). Coupling of air‑assisted liquid–liquid microextraction method with partial least squares for simultaneous spectrophotometric determination of some preservatives. Journal of the Iranian Chemical Society, 14, 643-653. Pant, I., Trenerry, C. (1995). The determination of sorbic acid and benzoic acid in a variety of beverages and foods by micellar electrokinetic capillary chromatography. Food Chemistry, 53 219-226. Petanovska-Ilievska, B., Velkoska-Markovska, L., Jankulovska, M.S. (2017). Development of reverse-phase high-performance liquid chromatography method for simultaneous determination of sodium benzoate and potassium sorbate in beverages. Acta Chromatographica, 29, 345-358. Sun, B., Qi, L., Wang, M. (2014). Determination of preservatives in soft drinks by capillary electrophoresis with ionic liquids as the electrolyte additives. Journal of Separation Science, 37, 2248-2252. Tfouni, S.A.V., Toledo, M.C.F. (2002). Determination of benzoic and sorbic acids in Brazilian food. Food Control, 13, 117-123. Waldron, K.C., Li, J. (1996). Investigation of a pulsed-laser thermo-optical absorbance detector for the determination of food preservatives separated by capillary electrophoresis. Journal of Chromatography B, 683, 47-54. Zor, Ş.D., Aşçı, B., Dönmez, Ö.A., Küçükkaraca, D.Y. (2016). Simultaneous determination of potassium sorbate, sodium benzoate, quinoline yellow and sunset yellow in lemonades and lemon sauces by HPLC using experimental design. Journal of Chromatographic Science, 54, 952-957.